GUTSEE Girls at the ready! From left: Lidia Frasz, Sarah Johnson, Norah Frasz, Kayden O’Neil, Katelyn Dittmar, Kami Chapp and Jade Fazio. During the summer of 2014, the Northern Michigan non-profit Raven Hill Discovery Center in East Jordan has provided middle school girls the opportunity to both learn and grow as part of their GUTSEE (Giving Useful Thinking Skill Explorations & Experiences) program. 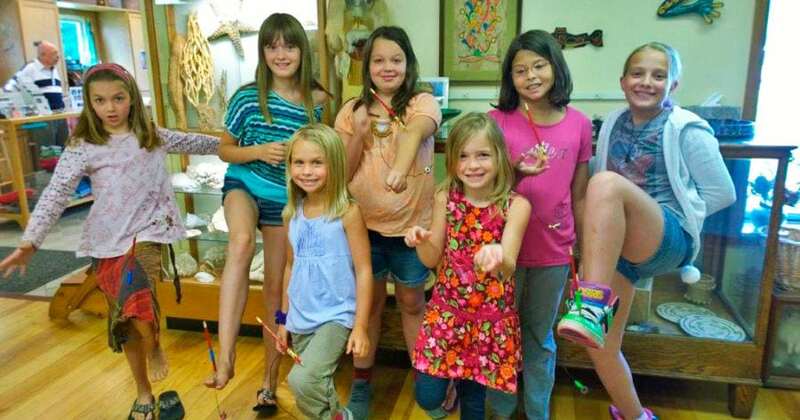 By combining science, Northern Michigan’s outdoors and creative activities into jam-packed morning sessions, Raven Hill Discovery Center has harbored an educational haven for Northern Michigan kids during the summer months. Balancing pencils, nails and hammers was the challenge Monday, August 18th, 2014 as participating GUTSEE Girls came together to actively explore gravity, while building their self-confidence & self-esteem. The GUTSEE Girls program is sponsored by the Hestia Women’s Circle of Giving, which serves Emmet and Charlevoix counties, so there is no charge to participate. Since July, the girls have met the first Monday morning of each week at Raven Hill Discovery Center for two-hour science sessions. The last summer session is Monday, August 25th from 10 am to noon. Any girls attending schools in Charlevoix or Emmet counties are invited to participate even for the last summer session. On Saturday, September 6th from 10 am to noon, the program will culminate with a Celebration of Success for all participants and their families, especially mothers and othermothers (sisters, grandmothers and aunts). Mothers and othermothers are always invited to partner with their girls to experience fun, hands-on science activities that promote physical science careers as a pathway to future economic self-sufficiency. For more information or to register for the last summer session on August 25th and/or the Celebration of Success on September 6th, call Raven Hill’s Cheri Leach at 231.536.3369 or email cheri@RavenHillDiscoveryCenter.org. There is also still time to treat yourself and your family to an afternoon or a day of fun and exploration at Raven Hill Discovery Center. Located between East Jordan and Boyne City, just off C48 at Pearsall Road and in Mile 15 of the Breezeway, Raven Hill helps visitors build connections between science, history and the arts in an interactive learning environment. In addition to the hands-on museum and the exotic animals, visitors can explore all the outdoor exhibits, including the music garden, Jurassic Park, schoolhouse, treehouse, wetlands boardwalk and the Ancient World. Raven Hill is open weekdays from 10 am to 4 pm, Saturdays from noon to 4 pm and Sundays from 2 pm to 4 pm (summer hours) until Friday, August 29th. Over Labor Day weekend, the Center is open on Saturday, Sunday and Monday, August 30th through September 1st, 2014 from noon to 4 pm each day. Winter hours go into effect after Labor Day, when the Center will be open noon to 4 pm on Saturdays and 2 pm to 4 pm on Sundays, and closed weekdays, except by appointment. For more information on Raven Hill Discovery Center, please visit RavenHillDiscoveryCenter.org or phone 231.536.3369.